Now for the birds that command the sky and don’t give hoot I am down below. 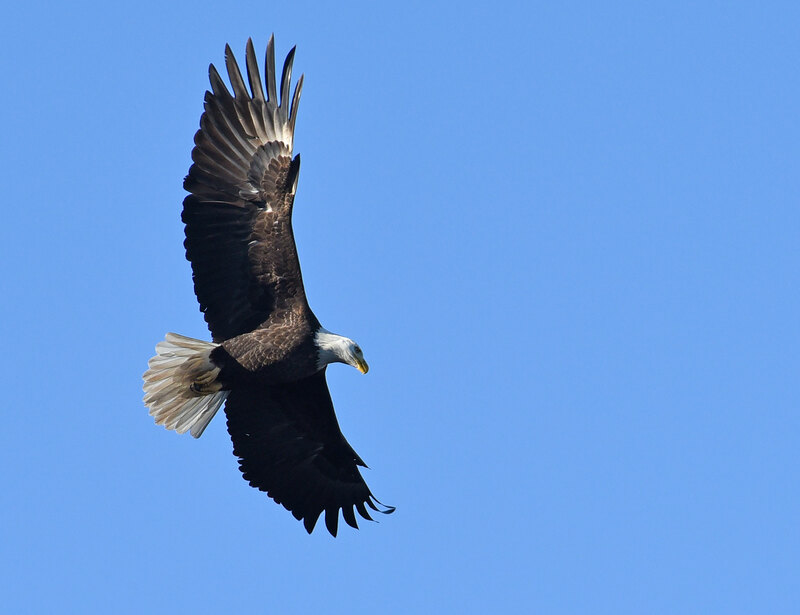 More and more eagles are here on Nature and Wildlife Pics and coming up on Garden Walk Garden Talk. I have enough images of eagles of all ages to write a book. But don’t pick up that eagle feather to use as a book marker! 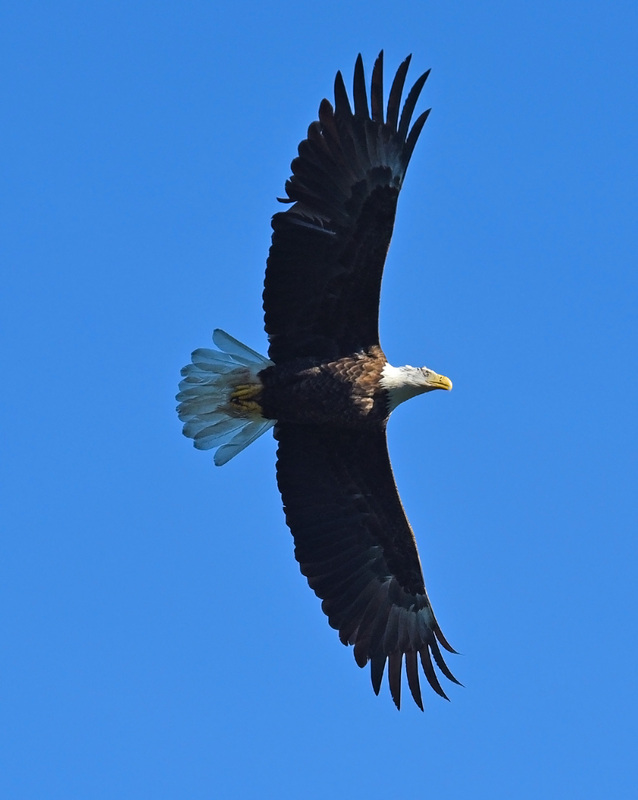 Did you know a person can not own eagle feathers unless they are of Native American ancestry? There is a federal fine up to $25,000 for anyone else! If you find an eagle feather, you must let it lie or give it to the authorities. If you want one, there are special requirements and a repository where you get one. Eagles have about 7000 feathers and they get new ones at every molt. When on a hike, I like to find feathers of different birds among other things like fossils, stones and colored beach glass. Below, the brown turkey feather I found on a recent walk can be confused for an eagle feather. An eagle feather has a solid shaft rather than the striped of the turkey. It also has white dots along the shaft if it is an eagle feather. It probably is best to leave feathers in place since the law even includes all raptors, all body parts from most migratory birds, endangered or threatened species, and is a violation of state and federal law. You can’t even own a hawk feather. 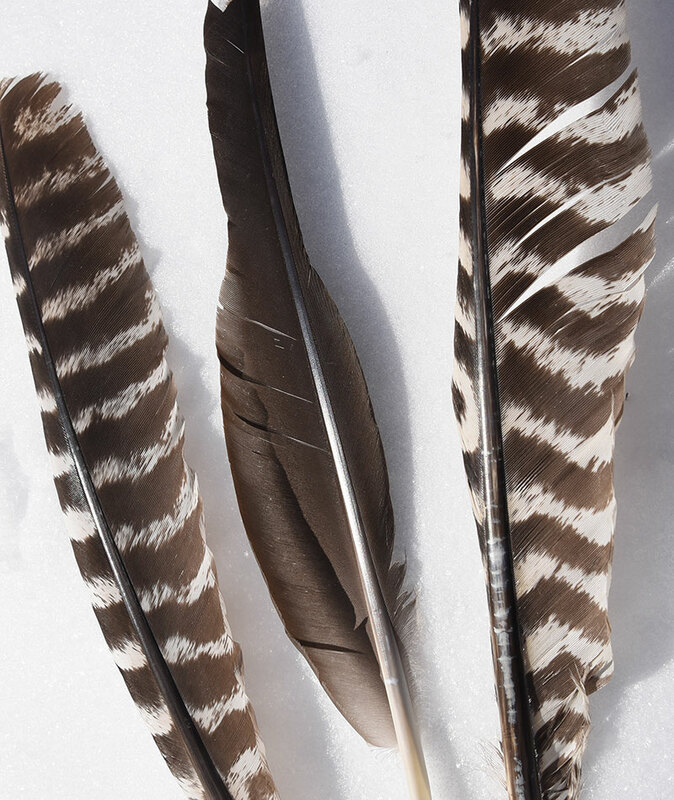 If you see an eagle or red-tailed hawk feather lying on the ground, don’t pick it up to take it home. Some very close family member may be bailing you out of jail. I guess the federal and state governments have a point. It really seems excessive to throw people in jail or levy a hefty fine for bringing home a feather, but state wildlife officers have no easy way to determine how feathers are obtained by people. The law applies for birds protected under the Migratory Bird Treaty Act, a pact signed by the United States, Canada and Mexico to prevent the killing of birds by plume hunters. 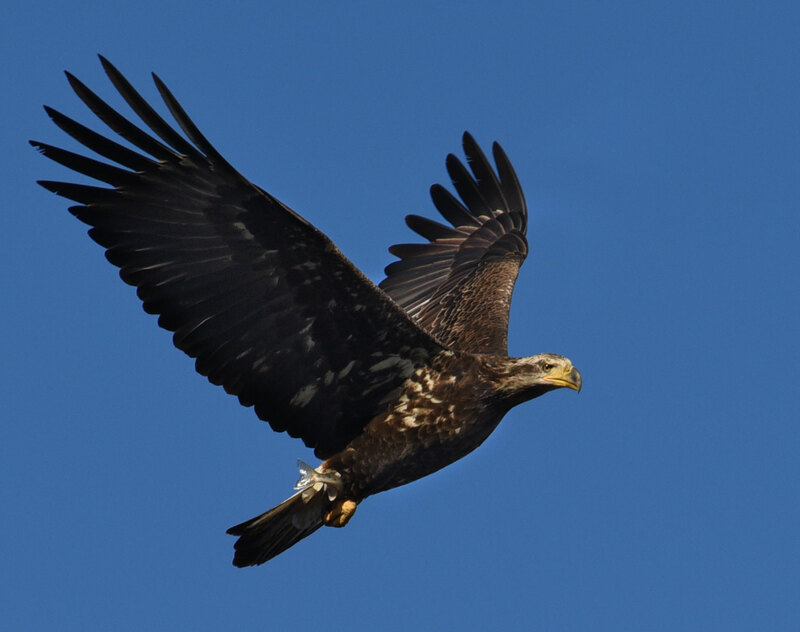 Another thing you might find interesting is that eagles sound like squeak toys when they call. The high-pitched call is a very small intimidation, so much so that when movie studios use eagles in film, they have dubbed in the Red-tailed Hawk calls as a substitute. I know when I first heard the eagle call, I thought it had laryngitis. The more I learn about these birds, the magic of them slowly erodes. On Garden Walk Garden Talk – See frozen Niagara Falls. 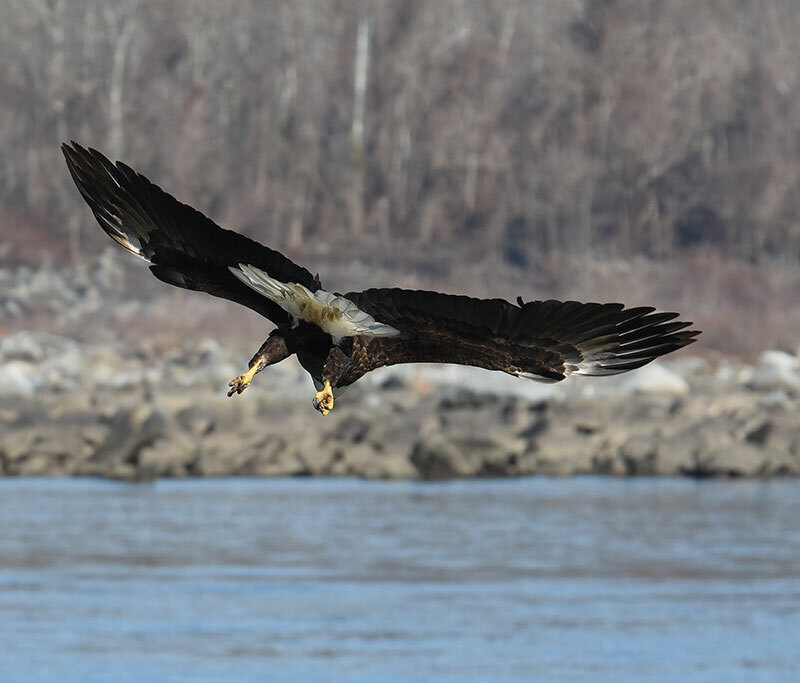 This entry was posted in Birds, Conservation, Environment, Nature, Photography, Photos, Raptors, wildlife and tagged American Bald Eagle, Bald Eagle feathers, Conowingo Bald Eagles, Photographing Bald Eagles, you can't own eagle feathers unless you are Native American. Bookmark the permalink. Beautiful Captures 🙂 My parents taught me at a young age to not touch nature and to look at it, DO NOT FEED THE WILD ANIMALS (BIG, HUGE, MAJOR Reminder), not go off trail, do not litter, etc. I still have that respect when out in the Great Outdoors as an adult. Wild animals also carry diseases that can be passed to humans, so best not to pick up and touch. I grew up on a farm and we were really careful and clean when working around farm animals – for their protection as well as ours. Good information, but as I kid I touched everything. My curiosity is still intact today. I had an eagle flying right close to my backyard today. I could not believe it when I opened your post today and you were writing about these big birds! I think the magic of them will not go away for me. I am amazed at how breathtaking they look every time I look upon them. If I hear them squak and do not like the sound as you described it–I suppose I might just have to ignore it! Great pictures as usual friend. Eagles are plentiful lately. Here we have about 25 of them not far from me. They are on the ice duck hunting. They wait until a duck is in starvation mode or dead. The healthy ducks get taken less frequently. Wow, that’s tough. I didn’t know about it, and I don’t know if I think that it sounds legit. Hard rules. But amazing photos! It is true. Don’t pick up feathers if you don’t know from what bird they come. Believe me, I won’t! Do you know why the rules are that strict? I mentioned why in the post, but in a reply to a comment from another, I gave an example involving one guy that got arrested. He was an prime reason for the law. The regulating agencies have no proof how one gets the feather, it could have been from someone like in the example I gave. I had no idea! Wow; I am definitely a ‘feather pickerupper’ and am glad that I’m in Ecuador.. Hmmm, maybe I should double check Ecuador’s laws! I like to draw/paint feathers from time to time as a warm up, so I’d better beware or I might be asked the source of my reference material! I can’t keep any feathers I find because I have a cockatoo and he could get a disease from them. I do like photographing them when I find them though. On the cockatoo, I do show him the images of big raptors on the computer screen and he goes balistic seeing a rival bird. He does not like pictures of other cockatoos either. Nice photos. I like the last one because it has a kind of federalist eagle look to it. Thank you. I wish it was in better light because I thought the same thing of its pose. 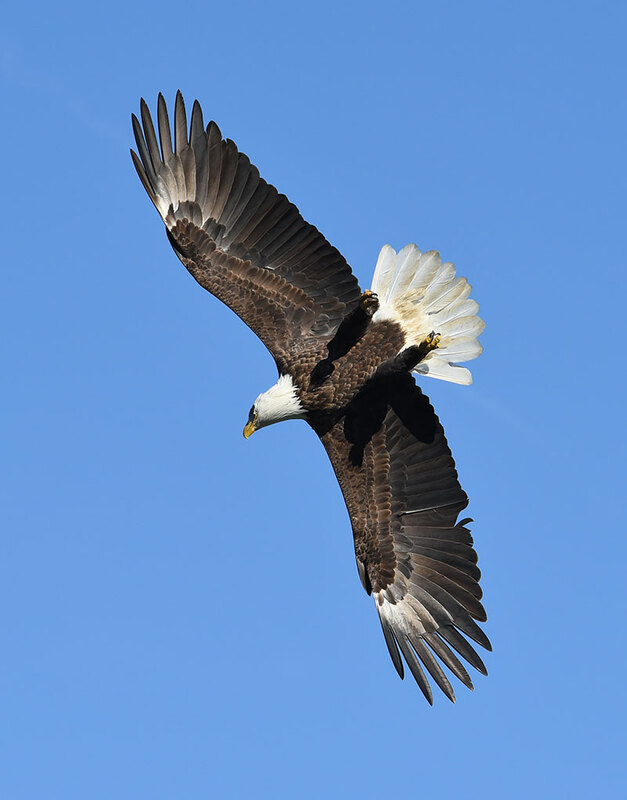 Magnificent photos of the Bald Eagles. I knew it was illegal to own a Bald Eagle, but I didn’t know it applied to all raptors, etc. Thanks for the information. Owning, killing, and even having a feather. It was news to me picking up a feather and keeping it could land a person in jail. I did see a story of a guy that killed a Bald Eagle by bashing it over the head with a piece of wood, just so he could have the feathers. The idiot posted on FB and the law came down on him. He only had a $60,000 fine which astounded me since his crime was horrific. Those eagle feathers certainly do look like turkey feathers. Great photos! They are wing feathers and they really do look similar. I had a hard time showing the lines in the turkey feather because of the bright sun and them being on snow. Simply wonderful images Donna. Where are more images of Hawaii trip? Most are on GWGT and I have more to come. While driving through the boonies of the there-corners area of the US, I spotted a bald eagle tethered to the roof of a Native American’s adobe house. Something seemed VERY wrong with this, as I listened to native Navajo language spoken on the local radio…yes I was in the NM boonies! Can Native Americans tether this bird??? I am not sure on the extent in which they can own an eagle. They must apply for ownership and have a completed application obtained from your nearest FWS Regional Migratory Bird Permit Office. Also they must show certification of tribal enrollment from the Bureau of Indian Affairs or Tribal Enrollment Office. When they apply, they are asking for a dead eagle or eagle parts. I never saw anything on them having a live eagle, but rehabilitation experts have them in captivity. But again that requires a license and permits. This fine bird was tethered by one leg to the roof of the building…hmmm. I would bet that comes under cruelty to animals and those laws would apply. If on reservation lands, our laws might not be applicable. Here, native people commit crimes and race back to the reservation. I don’t know what the police do in that instance. Interesting post, I didn’t know that about the feathers so I guess I’ll need to be careful! Beautiful photos. Me either. I did not realize it covered so many migratory birds either. I am glad I did not pick up eagle feathers in Conowingo. The eagles fight and feathers fly, it was easy to find one. The turkey feathers in the post came from a turkey that some animal must have killed and eaten at a nature reserve I visited. Feather were all over, I had to move them to clean snow for the picture. Very interesting post and wonderful photos – that first shot is spectacular!! Thank you. i bet you have birds down south that have the same restrictions. I especially like pink! I think it is because different agencies are involved I bet, but posting that notice is a good idea since I think rangers can help enforce it. This is a Federal Gov. Law. Something had to be done. Two non- Indian hunters shot 32 Eagles just for the heck of it. This happens alot. Thank you. I find it strange if it is found on the ground, but do understand why they have that law. Yes I can too, difficult to prove if it was found on the ground or attained by other means..
ps-oops, forgot to say, your photos are magnificent, Donna. I understand you. Kids should not have to pay the price especially when they are out exploring and learning. But I guess it is good for them to learn why there is such a harsh law. I never did see how many get arrested for that but I would bet a lot of rangers let people off with a warning. Others may disagree but I am all for that law. It isn’t aimed at kids picking up feathers but in making sure that even a small bit of evidence can be used to prosecute. Anyway, do we really ever need to own a piece of an animal to appreciate it? Take a picture or build a memory and try not to leave a footprint behind … that was what I was taught as a kid. It was briefly disappointing but a little self restraint is maybe a good thing. I felt the same way about eagle calls when I first moved to the west coast. Eagles were everywhere and pretty much one of the most common birds. But the first time I HEARD one I almost laughed. It sounded like a song bird. I think I remember hearing this about the eagle feathers, and I can see why…it is too bad. But I did not know about raptors….so thanks for the info…as always fabulous shots. Is there some unstated, perhaps mystical reason one cannot even pick up an eagle feather? It seems irrational! Must be more behind this law. It’s respect of ones belief and religion. The eagle is our world. I wouldn’t never tell someone I think your belief is crazy. 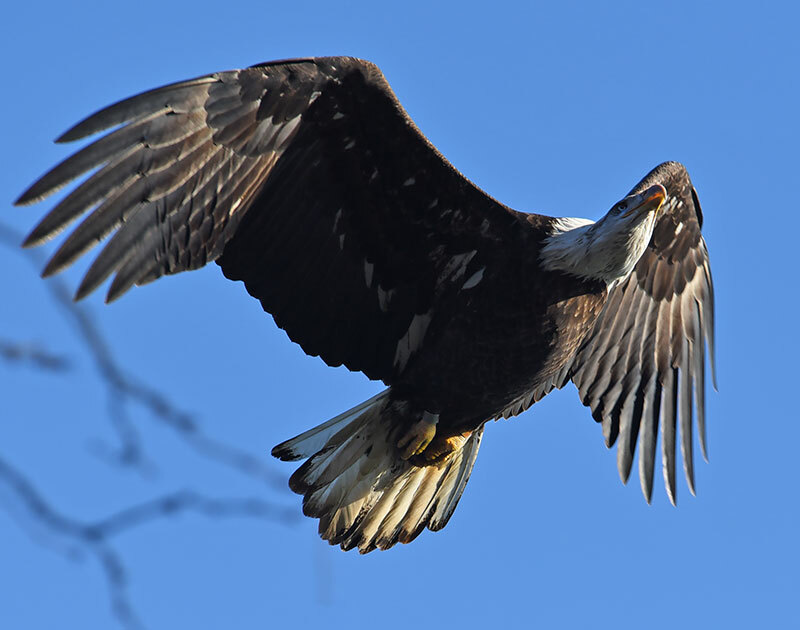 Even with the law to protect the Eagle, hunters still kill eagles for fun. Recently 2 hunters shot 32 eagles just for the heck of it. There has to be a law..or the day will come their will be no eagles left. I am Native American I can appreciate how Beautiful The Bald Eagle is. If your Native American you should have more to say about this !!! A friend who worked at our zoo in the caged bird area picked up eagle feathers. 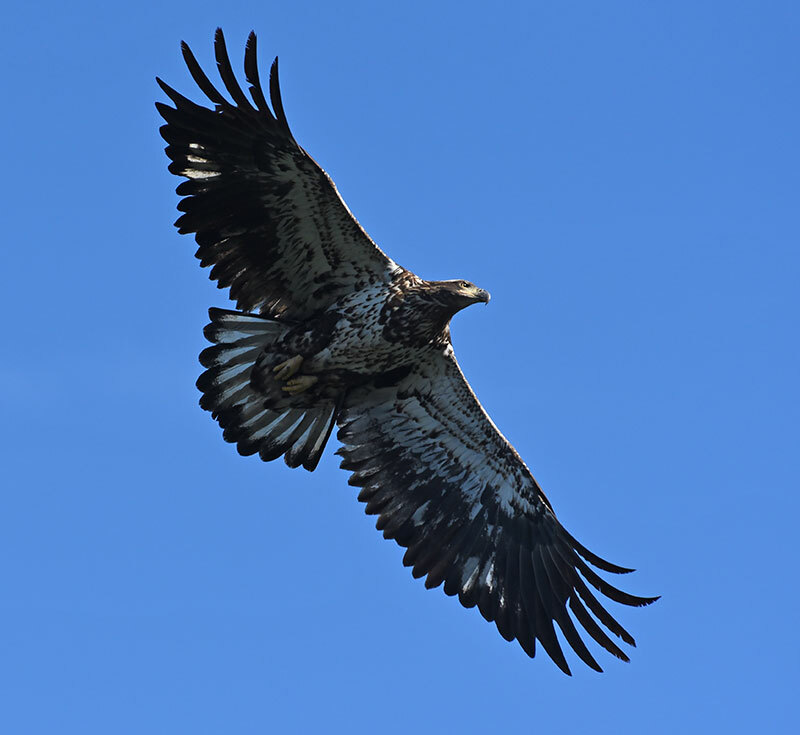 Whether they were golden eagle or immature bald eagle feathers she kept them! No one ever said anything about that being illegal! Oops! I thinks she fooling you…u can’t work in a Zoo that protects animal and not know about Feathers. Most likely she selling them or giving them away. As a Native I can’t sell them I can trade or give the feathers to another Native.